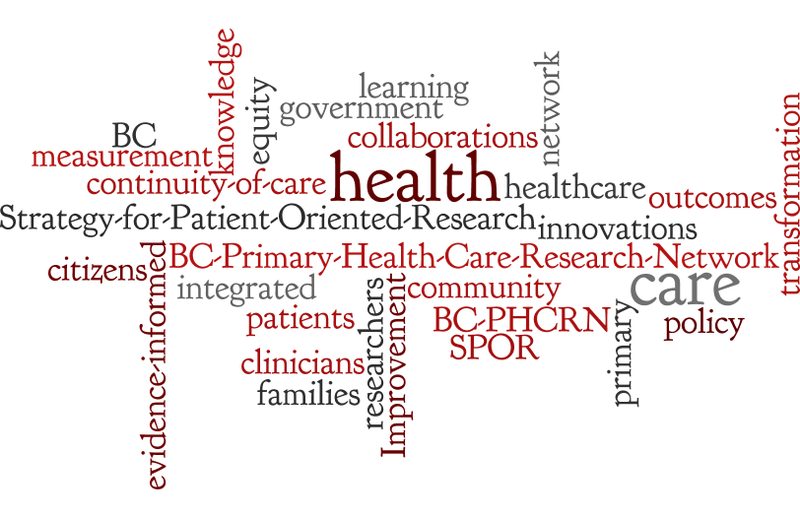 The BC Primary Health Care Research Network (BC-PHCRN) is one of 11 Strategy for Patient Oriented Research (SPOR) Primary and Integrated Health Care Innovations (PIHCI) networks in Canadian provinces/territories, designed to support evidence-informed transformation of the delivery of primary and integrated health care. The goal of the BC-PHCRN is to encourage, facilitate, and support collaborations between government, health authorities, health professionals, patients and researchers. The BC-PHCRN aims to seek out, develop, and facilitate adoption of health care innovations to improve BC’s health care delivery system. The BC-PHCRN is funded by the Canadian Institutes of Health Research (CIHR) and the Michael Smith Foundation for Health Research (MSFHR). Follow us on Twitter @BC_PHCRN or email us at info@spor-bcphcrn.ca.